Growing up, I thought brussels sprouts were dis.gus.ting. While I’m confessing, I might as well tell you that I didn’t like avocados either. Clearly, the first 16 years of my life were an epicurean wasteland. It turns out that my problem with brussels sprouts was that I was eating them (or not eating them, as the case was) steamed. And in my teenage self’s defense, I still think steamed brussels sprouts are kinda gross. But do you know what’s amazing? Roasted brussel spouts. Oh my goodness, roasted brussels sprouts are so deliciously amazing. And when you add some balsamic vinegar into the mix? Heaven! They are nutty and just a drop sweet, thanks to the wonderful caramelization that comes from roasting veggies. Not only have I come to love roasted brussels sprouts as an adult, but my eight- and ten-year old sons already love them! Clean and check brussels sprouts well, then cut in half length-wise. Toss brussels sprouts with oil and vinegar and spread out into one layer on a cookie sheet. Roast for 20-25 minutes until the brussels sprouts begin to caramelize. We tend to make two pounds of brussels sprouts, so we double the rest of the ingredients, as well. My family of five can easily eat all two pounds in one meal! * Note on kashrut: There are varying opinions as to whether brussels sprouts can be sufficiently cleaned and checked with regard to bug concerns. I know that many, therefore, do not eat fresh brussels sprouts. If you want to make this recipe with Bodek frozen brussels sprouts, I think your final product will be a very close approximation. I do recommend roasting them from frozen, rather than letting them defrost, to avoid sogginess. Check the cook time – they might not need as long. Try turning up the heat for the last two minutes to expedite the caramelization. What’s your favorite easy veggie side dish? Do you have any childhood food dislikes that have became an adulthood favorite? All these poor brussels sprouts. Ruined with boiling water! Mara – I hear you! My mom so overcooked frozen veggies, I couldn’t eat them. My fresh veggie epiphany came in middle school when leaving for a field trip. The Science teacher had us put our heads out of the bus windows and popped a fresh pea from the pod into each of our mouths. (Try doing that now, it wouldn’t work.) It was so sweet and delectable that I was hooked. As soon as I was on my own, fresh veggies ruled the day. Fast forward to having children. The kids never really liked fresh veggies. A bunch of years ago we ended up in a situation where allergies, etc… caused a change in how we cooked. Hmm, how was I to reinvent fresh veggies, which I usually slightly steamed or stir-fried, and learn how to use unfamiliar fresh veggies? I decided to hang around the fruit and veg market and when someone grabbed a veggie, I asked them how they cooked it. I had so much fun and folks loved sharing their recipes. A winner: almost any green veggie sautéed in fresh garlic and a little bit of olive oil. Brussels sprouts – if you eat fresh and feel you can clean them well enough, try cooking them on the stalk. Great presentation and yummy. The directions are usually attached to the stalk, though it’s easy to find recipes on the internet. I’m going to try the balsamic vinegar as soon as I can get to Costco for the Brussels Sprouts. We love balsamic vinegar. So do you sprinkle the balsamic vinegar on after they’re cooked or before? I mix all the ingredients and put them on the sprouts before they are cooked! Hope that helps! brussel sprouts for over two years. I am unable to find them anywhere, including the big cities like Chicago, Baltimore and NY. Oh no – did you ask at your kosher grocery stores? I wonder if the manager would have any insights. Maybe if you call, they can help you find out where to buy the Brussels Sprouts. I hope you find them. They’re back in the stores! I hated asparagus for exactly the same reason! My mother boiled it and it was mushy!–or, even worse, she served canned. I was in my late 30s before I found out it could be good steamed crisp tender or grilled. It’s YUM. Haven’t tried with balsamic yet but I will, they are delic with just roasting in over with olive oil or meyer lemon oil, if you think these are good then also try cauliflower and roast the same way-yummo. I have never heard of bugs in Brussels Sprouts. In The Netherlands (Holland) it is a very popular vegetable and always eaten fresh ! Never found bugs in them as well. I will certainly try out your very intriging receipe. To me it seems delicious and it is something new for me. Thank you very much. Mmm, that would be lovely too! They didn’t even ‘sort of’ need parm! Although I am sure it would be good cuz parm added to anything is great, but HOLY SMOKES these were sooooo good on their own. So much so, that my husband who hates them, now says he likes them! Thanks! Hooray! I love that the recipe converted a former sprouts hater. YAY! Do you roast them cut side down or up? They’re both ways – it doesn’t really matter. The cut side up do get a bit more caramelized. In the oven now!!! I love balsamic vinegar do it can’t go wrong. When I told my husband that’s what I’m making for supper he looked at me like a little kid being forced into spinach!!! I’m betting he loves them!! Oh gosh, the pressure! I hope he loves it! I must have done something wrong. The outside was yummy but, the insides were bitter tasting. Mind you, these cake from a small town grocery store in Central Illinois so they probably aren’t the best quality. I will try again this summer when I can get them fresh at a farmer’s market!! Oh no! Were they hard or mushy inside? 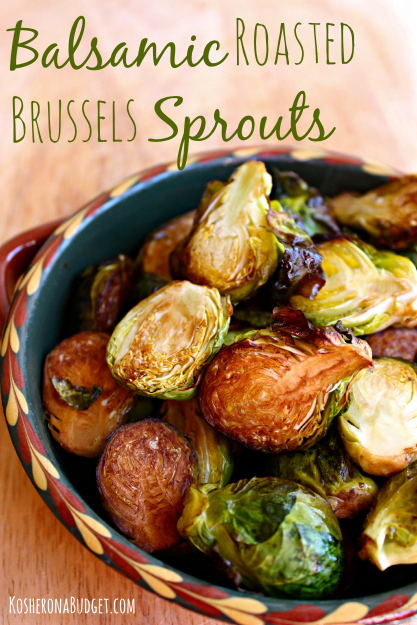 I think they have to be el dente so to speak – that’s the sweet spot (literally sweet) with brussels sprouts. I made these a couple weeks ago and am about to make them again tonight. I use frozen brussel sprouts but at the end of the cooking time, I turn the broiler on and give them a few more minutes. They came out perfect! Not mushy at all! Yay! That’s good to hear! Thanks, Karrisa! Yes, they probably are. But you can roast them whole, too!